Organised by the Hong Kong Tourism Board (HKTB), the ICBC (Asia) e-Sports & Music Festival Hong Kong, will be staged from 24 to 26 August (Friday to Sunday) in Hall 3 of the Hong Kong Convention and Exhibition Centre (HKCEC). This year, the Festival will be larger in scale and will feature three international e-sports tournaments, with over 110 players from all over the world, including United States, Russia, Korea, Mainland China and Hong Kong. One of the highlights of the Festival, the Experience Zone, will be scaled up to include the latest e-sports games and related products. To enrich the visitor experience, the HKTB is collaborating with the Chamber of Hong Kong Computer Industry (CHKCI) to provide a special ticket promotion to ticket holders of the Hong Kong Computer & Communications Festival and the ICBC (Asia) e-Sports & Music Festival Hong Kong e-sports tournaments. (From left to right) Ms Gao Ming, Chairman and Executive Director of Industrial and Commercial Bank of China (Asia) Limited, and Dr Peter Lam, Chairman of the HKTB, officiate at the ICBC (Asia) e-Sports & Music Festival Hong Kong launch ceremony. The ICBC (Asia) e-Sports and Music Festival Hong Kong will include three top international e-sports tournaments, featuring a strong player line-up and the highest prize pool in Hong Kong’s e-sports history. Three top international e-sports tournaments will be staged: the acclaimed “Return of the Legends 2018” and the two brand new tournaments – the “ZOTAC CUP MASTERS CS:GO 2018 Grand Finals” and the “Hong Kong PUBG World Invitational”. In the “Return of the Legends 2018”, former winners of world championships and other legendary players will form two teams, Team East and Team West, to compete for glory. Organised and sponsored by renowned Hong Kong based gaming hardware manufacturer ZOTAC, the “ZOTAC CUP MASTERS CS:GO 2018 Grand Finals” will offer a total prize pool of US$300,000 (over HK$2 million), setting a new record in Hong Kong’s e-sports tournament. Fourteen international and two Hong Kong teams will compete for the “Hong Kong PUBG World Invitational” championship, with total value of prize money reaching US$150,000 (over HK$1 million), which is the largest amount ever in Hong Kong’s PUBG tournaments. Over 110 Hong Kong and international players will participate in three e-sports tournaments, including several world renowned players. In addition to adrenaline-pumping e-sports tournaments, there will be an Experience Zone, showcasing the latest e-sports-related products and featuring game displays, VR experience, mobile game trials, KOL stages, and music performances. Visitors can enjoy fascinating activities and experience game products first-hand. The e-Sports Education Partner of the event, CLP Power Hong Kong Limited sponsors to set up a “CLP x e-Sports Academy” on-site to introduce professional knowledge of the e-sports industry and to share tips of using smart home devices to enhance gaming experience. The HKTB is also partnering with the CHKCI to provide a special ticket promotion with the Hong Kong Computer & Communications Festival. Visitors can enjoy a special ticket price to enter the two events. The HKTB will collaborate with key online platforms and will live stream three e-sports tournaments in three languages (Cantonese, Mandarin and English). Tickets for all e-sports tournaments in the ICBC (Asia) e-Sports & Music Festival Hong Kong will be available for sale at Hong Kong Ticketing from 16 July (Monday) onwards and are priced at HK$250 HK$120 and HK$50. The admission fee to the Experience Zone is HK$10. Tickets will be available at the HKCEC box office during the Festival. Ticket holders of the Hong Kong Computer & Communication Festival 2018 will be entitled to free admission to the ICBC (Asia) e-Sports & Music Festival Hong Kong — Experience Zone on the same day; and ticket holders of the ICBC (Asia) e-Sports & Music Festival Hong Kong e-sports tournaments will be entitled to free admission to both the Experience Zone and the Hong Kong Computer & Communication Festival 2018 in Hall 1of the HKCEC on the same day. 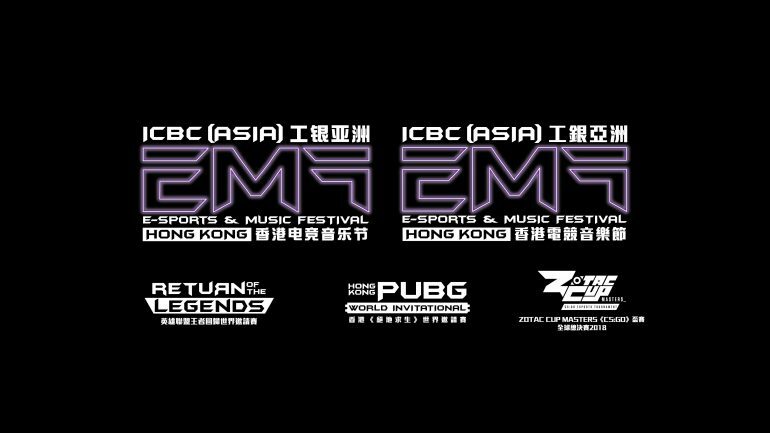 For more details about the ICBC (Asia) e-Sports & Music Festival Hong Kong, please refer to the factsheet or visit the website: www.emfhk.com. Officiating guests are joined by representatives from sponsors and supporting organisations for a group photo.